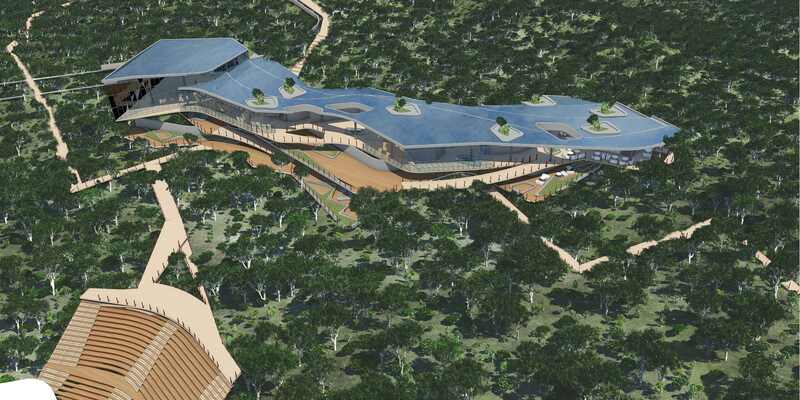 This is a proposed cable car at the second biggest attraction in Mpumalanga, Blyde River Canyon, the world’s largest green canyon and the third largest canyon overall. The site has numerous hiking trails, and visitors are offered a range of adventure activities including rock climbing, kayaking, quad biking and river rafting. The design conceives an invisible building that merges with the folds of the hillside. The tiered roof is entirely covered with water and planting; and a pair of sliced openings is all that reveals the presence of the structure. The structure is seated on deep-rooted footings, a solution that enables the building to conceal itself and blend into the landscape.